Notice two 1959 vehicles in this picture?! 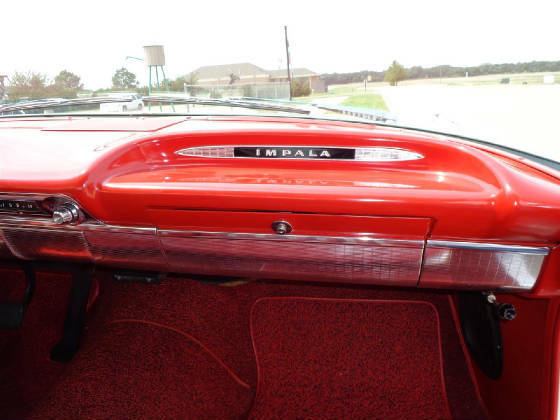 The Impala was originally purchased by Wade and Villa Hilton of Binger Oklahoma in July of 1959 from Evans Chevrolet. 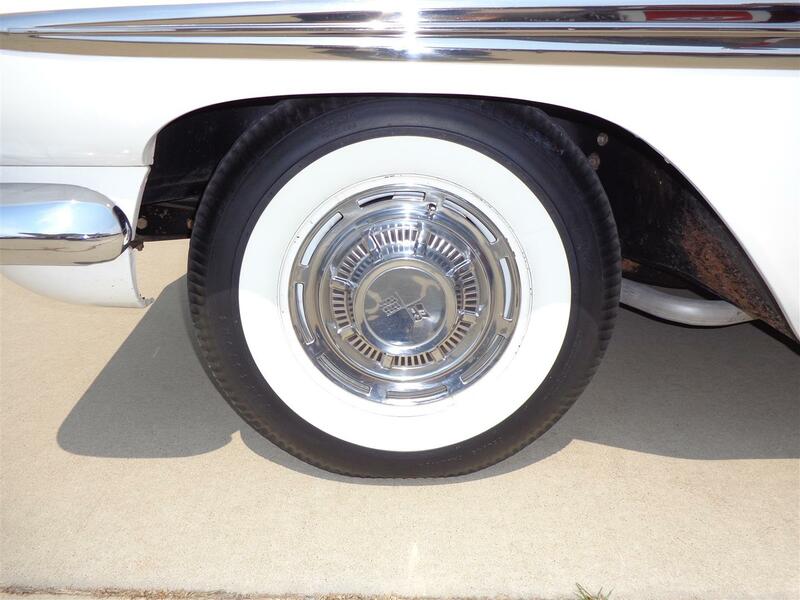 Dennis and Sharon are the current and second owners this classic Chevy Impala. They purchased the Impala from Aunt Villa in December of 1999 about two years after the passing of Dennis’ uncle. Dennis’ Uncle Wade owned an auto parts store and wrecker service in Binger and usually drove the wrecker or just walked to work. The Chevy was purchased without power steering, power brakes or air conditioning which probably is the reason it has so few miles on the car. The Hiltons bought a new Oldsmobile in 1975 with all the bells and whistles, which lead to the Impala sitting in a garage for over twenty five years. 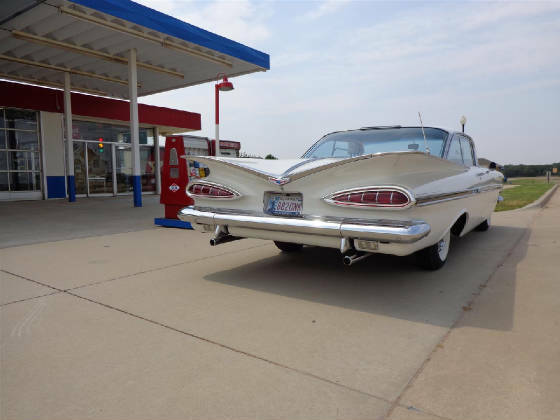 Thus, the speedometer reading of 57,443 original miles on the day Dennis brought the Impala by the Old Gasoline Station in the Oklahoma Territorial Plaza in Perkins Oklahoma. 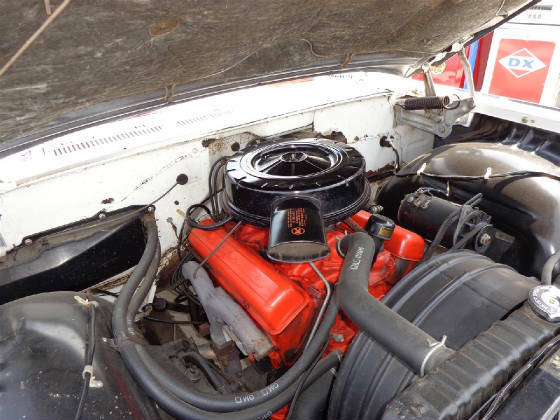 Listed as options on the classic: V8 Engine $185, Powerglide Transmission $75, Oil Filter $15, Radio $58.25, E-Z Eye Glass $40, Deluxe Heater $30, and Whitewall Tires $8.50. The Wades ordered the two door Impala Sport Coupe with a 283 V8 and Powerglide transmission. 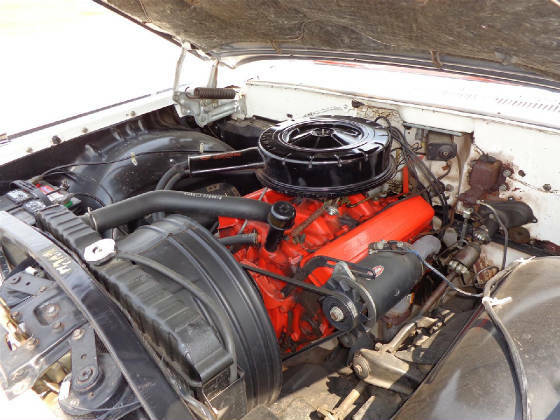 In 1959 the 283 cubic inch V8 with a two barrel carburetor delivered 185 horsepower at 4200 RPMS and 275 pounds feet of torque at 2200 RPMS. 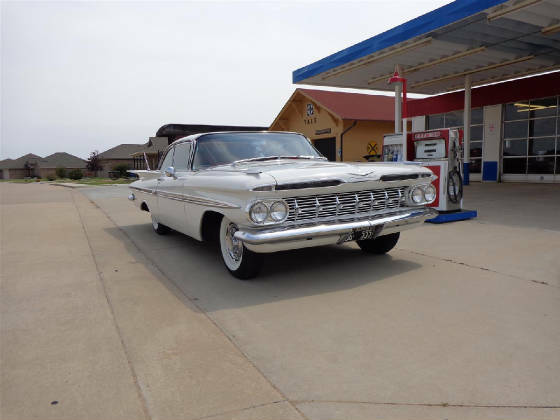 Dennis credits Barry Parish of the Auto Clinic in Edmond Oklahoma for the complete overhaul to the 283 V8, complete brake job, new dual exhaust system, practically every seal replaced, radiator repair, heater core repair, and turn signals repaired. 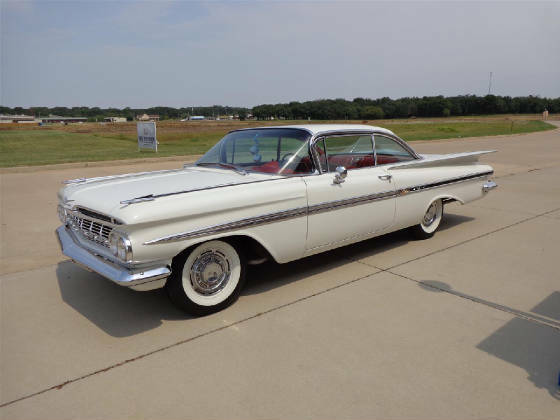 The 1959 Impala Sport Coupe was General Motors most elegant Impala. 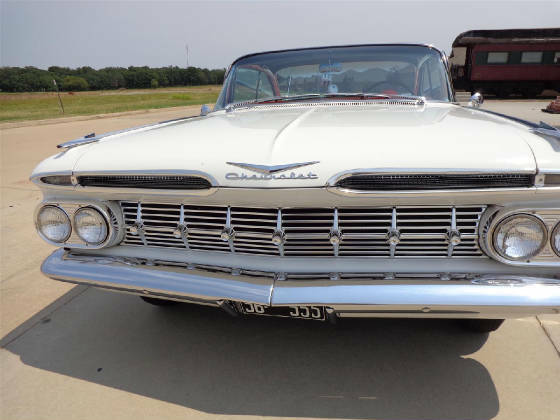 From the winged shaped of its rear deck to the simple elegance of its grille, this car was fresh, fine and fashionable according to Chevrolet advertisement. Customers got what they wanted, more spacious interiors, vast new areas of visibility, a longer lasting finish and great economy. As you can see, the original paint on this classic is still in great shape. 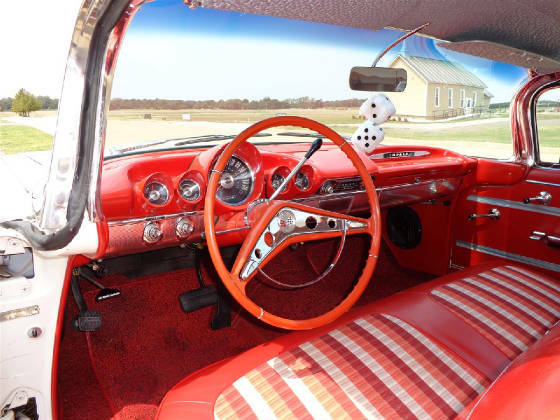 The interior is still just as it came from the factory in 1959 with the original red upholstery, carpet, steering wheel, and gages. 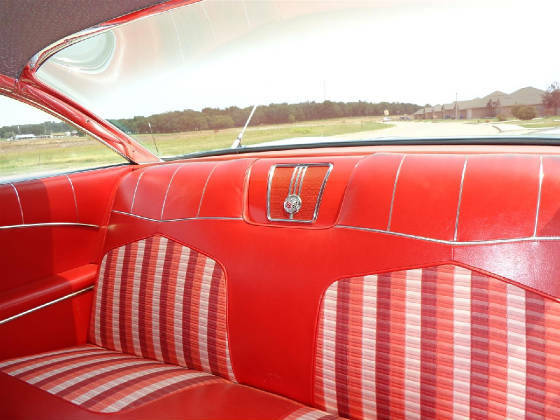 Dennis says that the original clear plastic seat covers, which had protected the originals for all of those years, were removed in the summer of 2000. 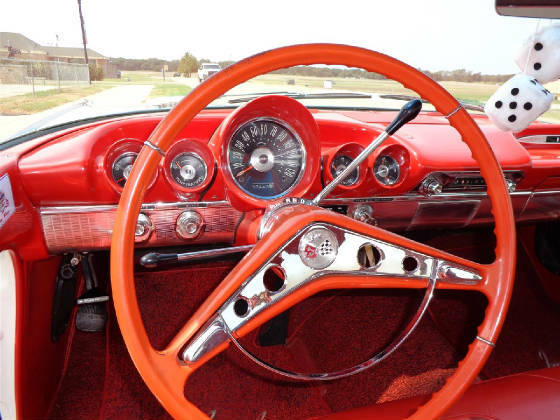 Notice the unobstructed, wide angle of view from the rear window of this classic Chevy! 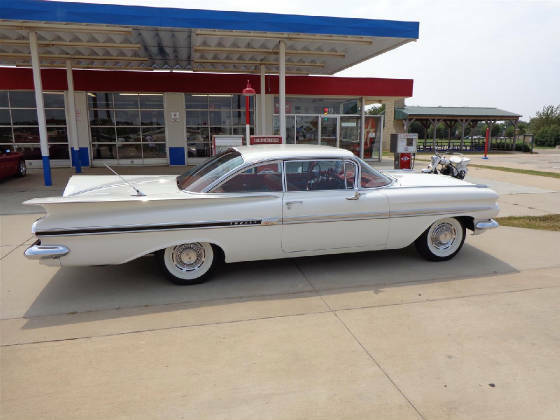 What a grand vehicle to tour the USA classic highway Route 66! The Late Great Chevy sets on Firestone 7.50-14 wide whitewall tires just like the ones it originally came with and the original wheels and original factory hubcaps. 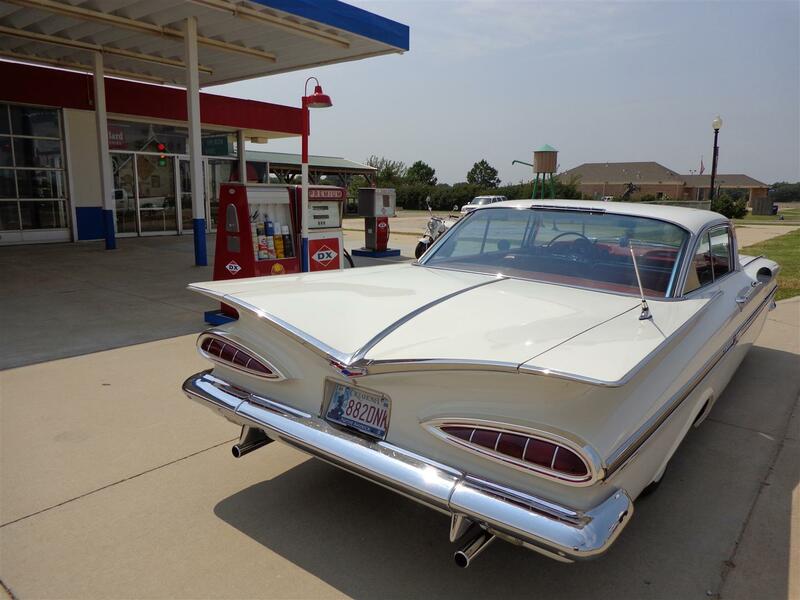 The 1959 Chevrolet was completely different from the 1958 and was a one year only design. The rear end has wings resembling a seagull and under the wings are the famous taillights that appeared to be "cat eyes". Dennis and Sharon Doughty are sincerely commended for the care, the love and dedication in preserving this wonderful classic car for the rest of us to enjoy! 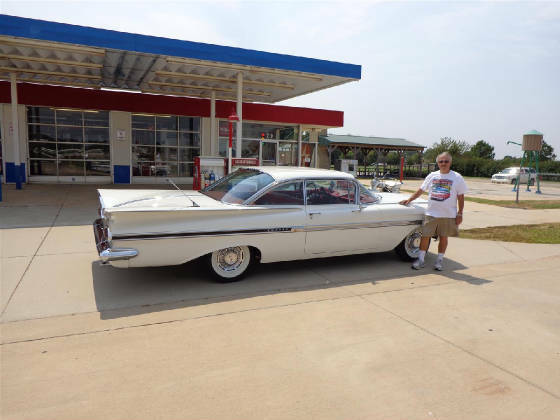 Their 1959 Chevrolet Impala Sport Coupe is truly a Great Oklahoma Classic. 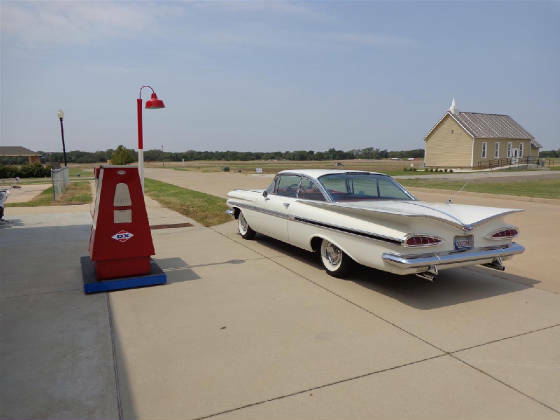 The Cimarron Starlite Cruisers appreciate Dennis and Sharon Doughty of Edmond Oklahoma for sharing their unrestored original 1959 Chevrolet Impala Sport Coupe as our Great Oklahoma Classic for September 2015!